This was a crazy busy Friday and I kicked up some dust trying to get everything accomplished. I haven't taken the time to show many of the insides of my cards lately, so here's the tag from the front and the inside finished out. On the image on the inside I used the rock 'n roll technique, ink up the stamp with one color then roll the edges around on the second color, I didn't know if it would work with these dark colors, but, I'm very pleased with the two-tone effect. I ruffed up the edges and direct to paper hit and dragged around for an aged look. Supplies: Kraft Card Blank 4" X 5 1/2" Paper Reflections, Papers: Making Memories-Denim Collection, SU-Ivory Naturals Card Stock, Stamps: CTMH-D1101-Blue Jeans, C1280-Out West, B1305-Yeehaw, Ink: SU-Not Quite Navy, Cajun Craze, VersaMark, Judikins copper embossing powder, Elmer's Copper Leafing Pen, SU-ticket punch, The Paper Studio Spare Parts-copper tiny brads, star stickers unknown, tag template-Coluzzle, hemp cord unknown. OH, this is too cool - I really thought that was denim, awesome technique! Yes, this came out really well and will make someone very happy. I am back and forth on finishing the insides of my cards, I think it is more of a time thing than desire - but it really adds that extra finishing touch doesn't it? What a fun card! Love the jeans pocket and tag. Awesome "rusty dusty" creatuion. Thanks for joining us at Gingersnap Creations. 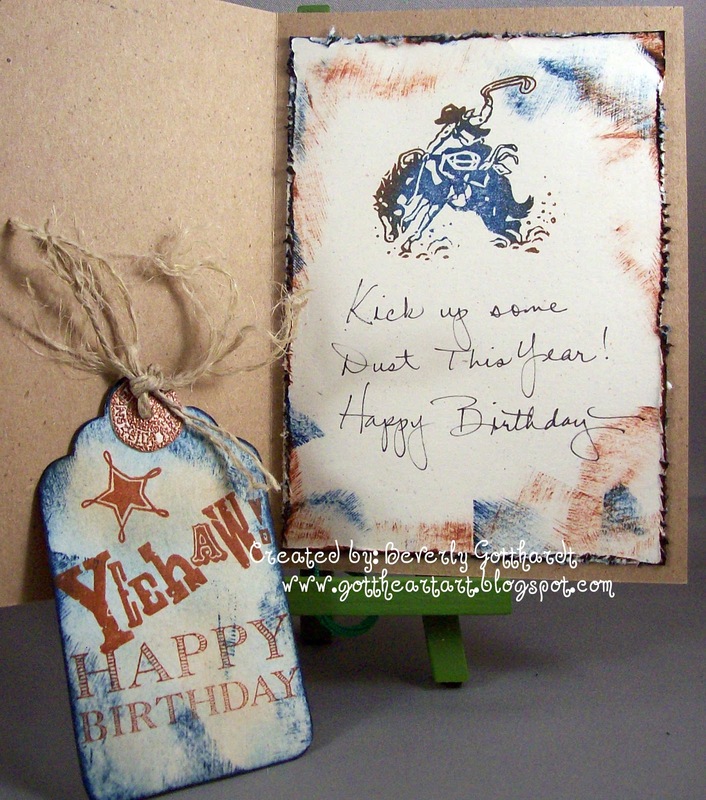 Wonderful card, Beverly--great technique! 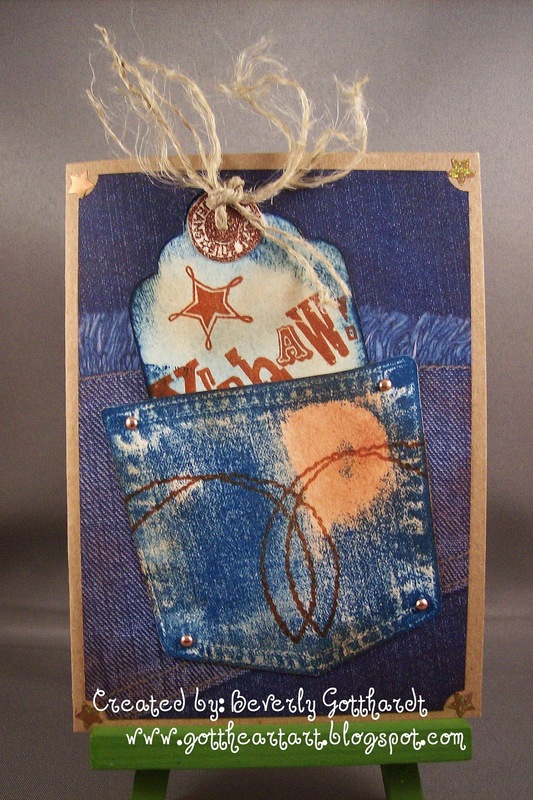 Thank you for joining in the denim, rust, and dust challenge at Gingersnap Creations! Lovin' it! Great idea to use a pocket and totally fab card!